Thanks to the 2015 TBR Pile Challenge, hosted by Roof Beam Reader, I was able to cross off a book that was on the first page of my list! A book on the first page of my list (it’s in one of those Moleskine agendas) has probably been on my list for several YEARS. 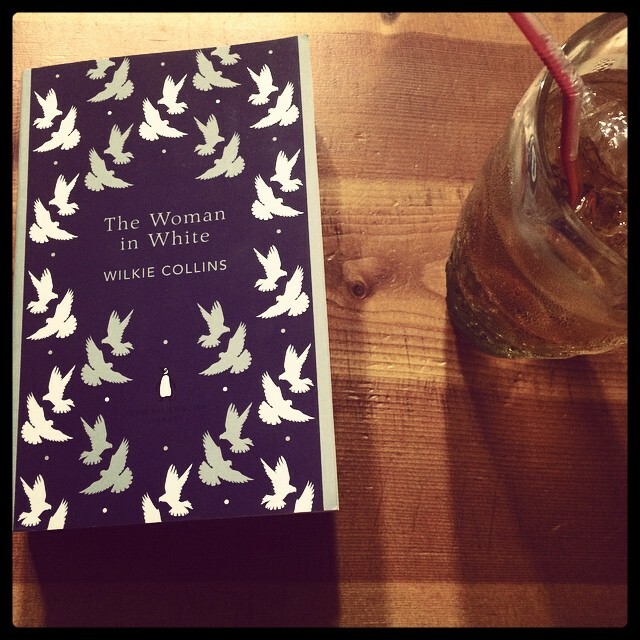 This time, the book that had been waiting for a read was Wilkie Collins’ The Woman in White. For someone who professes to love crime fiction as much as I do, it astounds me that I only just now read one of the early examples of the genre! The plot is more or less thus: Walter Hartright, a drawing teacher, is about to take a position in Cumberland when he meets with a young woman dressed entirely in white one night. She is very agitated and asks for his help to make her way to London. He helps her and it’s only after he sees her safely into a cab that he finds out she has escaped from an asylum. He is completely unsettled by it and when he’s been in Cumberland for a day he makes a connection with the house he’s staying in and the woman in white. And that’s how Walter, his love Laura Fairlie and her half-sister Marian Halcombe come to be ensnared in the net that Sir Percival Glyde and Count Fosco have set. This book was published in 1859 and in many ways it is very much a product of its time, especially when it comes to its portrayal of women. Women are constantly described as weak and hysterical, their memories can’t be counted on, they need to be protected from really horrible news because they can’t handle it and it’s best if they just stay home and endeavor to be calm. Count Fosco does have a soft spot for calm, collected, brilliant, lovely Marian Halcombe but stops short of full admiration because, after all, she is just a woman and not actually a worthy adversary. So there. I read The Woman in White! And I have The Moonstone kicking around now too. I don’t disagree! Dickens and I have a complex relationship where I acknowledge his genius but can’t always enjoy it. I love the cover of your copy – so pretty. I have had this book for a long time, but haven’t read it, so it’s encouraging to hear that you liked it. It is true that you have to remind yourself that what was considered shocking decades ago isn’t at all shocking now. Did you find it too long and drawn out at all? The Invention of Murder also looks good! I think I kind of knew that that might be an issue so I was prepared for it. The writing was good enough, the characters interesting enough to keep me interested despite the length of it. Because it *is* long. I really need to read The Invention of Murder soon! Yay for checking another off the list! I love the Gru comparison! I really liked this book, and The Moonstone. Remember being immersed into them deeply, even if certain aspects were very much now outdated. You kind of have to give them a free pass on that though don’t you? It can be fun and illuminating to read about how things used to be done even if it’s hard to understand sometimes.